Tempted to put a “coming soon” message on a yard sign or in an ad for a property you’ve agreed to sell for a homeowner? Keep in mind that you must comply with REBBA 2002 and the advertising guidelines. Remember, advertising cannot be false, misleading or deceptive. The first question you should ask is “coming soon to what?” The answer to that must be genuinely accurate and truthful, otherwise, it could be considered false, misleading or deceptive. For example, if you have an MLS listing with a commencement date in the future, the sign should read “coming soon to REALTOR.ca.” Otherwise, it would not be truthful. Some boards and associations do not permit this under their MLS rules or have additional requirements, so check with your local board or association. 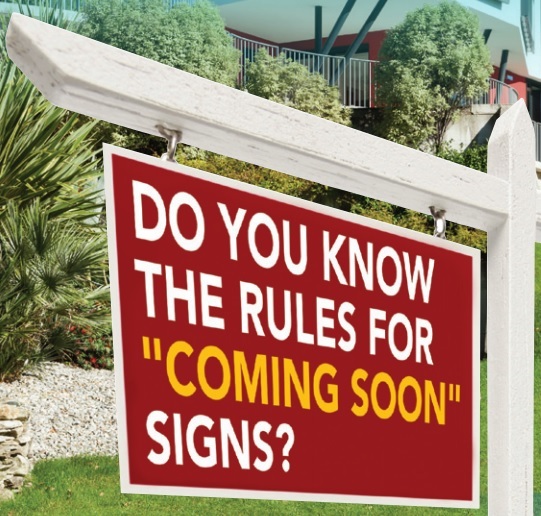 Or, imagine that you are working with a prospective seller, before they have signed a listing agreement, who has agreed to allow a “coming soon” message on a lawn sign or other advertisement. If you have written consent from the seller, the sign could be compliant. Keep in mind that advertising a property for someone who has not signed a listing agreement comes with risks. Display the registered name of your brokerage and its designation clearly and prominently. Salespersons and brokers must display their registered name with their designation. Only display an MLS logo if the property is on a board’s MLS® system. Check out more articles from the Winter 2015 edition of For the RECOrd here.